The first time I can recall doing it, I was 17 years old. In the beginning, it was because that was my job. Three days a week, after spending considerable time “dolling up” myself in the bathroom, I would leave school early and hurry through Bridgetown, to that special room to participate in the activity. A veteran in the industry had handpicked me. He was tall, authoritative, a big man with big hands and the most soothing voice that compelled any woman to heed to his every command. He made it seem like an art as he got down to business. I thought to myself, “There’s no way I could handle this, I am too young, too inexperienced.” But I was also keen to learn and to become good, even great at it. I was placed under the guidance of a woman called Martina. She had been doing it longer than I had been alive! Martina was pretty, well put together and highly respected by many people in the field. I was surprised to learn that she had recently given birth to a baby girl and had so quickly regained her figure to be back at work. Martina exercised much patience in teaching me the finer rudiments. She showed me the best way to position myself, to fit whatever came my way properly in place. Given my height, this sometimes meant having to do it on a stepladder. At other times, I literally had to contort my body or get really low down to adequately perform my duty. One of the most interesting aspects of my job was learning names, noting who came when, how often, in what order and on what dates. This helped in ensuring that each got fair play. And considering how many of them were in that room on any given day, my task was challenging to say the least. As for the various personalities and in some cases big egos, with which I often had to deal, Martina taught me little tricks that to this day I still use to both make that memorable first connection and to encourage continuous interaction. One guy in particular, whose reputation preceded him, offered to school me in ways that Martina couldn’t. Like any giddy headed teenage girl, I yielded to the temptation when he invited me to come watch him work. Pretty soon I was joining in and over the next few months it became such a regular occurrence that we were soon the talk of the building. Word got around about my skills, that I was a quick and willing learner with great potential, and next thing I knew, everyone wanted a piece of me. I ended up doing it for six consecutive months and truth be told, I loved every minute of it. Almost two decades later, I can say without shame that because of that background, I know how to always keep it tight. I learned then that no matter how big the challenge, I can conquer it with the right attitude, dedication, passion and of course, it never hurts to have expert guidance. My most recent ex-boyfriend Kevin, here in New York, does not know about that part of my history in Barbados. But he often told me “You keep it tight.” He said it was a pleasure to experience how I give attention to every detail. He specifically pointed out the way I kept “everything” in order: from ironing all my clothes after I have finished laundry before putting them into my closet, to not having a cluttered inbox by filing e-mails into folders; to never leaving home with my bed unmade or dirty dishes in the sink and always remembering my friends’ birthdays without a prompt from Facebook. 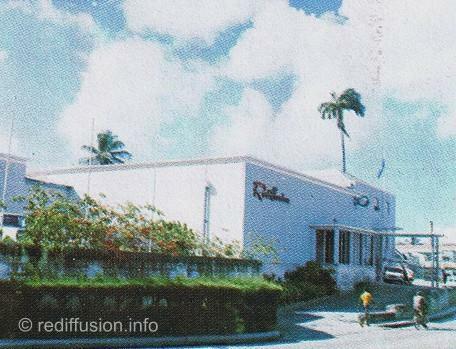 The old Rediffusion Barbados building in Bridgetown, now Starcom Network. So yes, I am proud of what I did at age 17. As a huge music enthusiast, I was especially thrilled to work in the music library at Barbados Rediffusion that served three of the island’s top radio stations. The opportunity to work in that special room of back to back, wall to wall vinyl LP records (78 RPM included) of all genres of music spanning more than five decades; diligently filing them and compiling music programs for on air personalities – that was my greatest lesson in how to keep it tight. Proving you are in the right field. I figured it had to be in the media field, but I couldn’t know of course that it was in the music library. Sounds like a great job. I’m sure you would have gotten to listen to a lot of great music because of that. Writing is an art. A skill so lacking in many of us today. Without a doubt you exemplify the qualities of a great writer. Your writing skills are amazing. You had me from the beginning to the end. Too sweet for words. Hahahaha! I hope that’s a good thing. ;-) Thanks! Bless up. Ragga my dear, no doubt you always provide a refreshing interpretation of true human interaction. Inspiration is your muse and you make her proud. Keep writing friend. I see you have a way with words. Very nice read, i enjoyed it!!!! !